Air Rescue is a full-service air conditioning and heating company owned by Jim Myers, who is also the president of the company and developed the “green” safety duct system that Air Rescue uses. Air Rescue services only residences, not new-build construction or commercial properties. It offers repair of units as well as replacement, if needed. 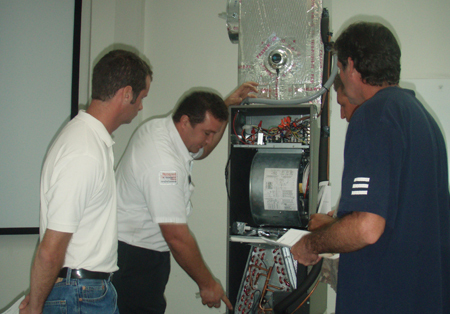 It can service all brands of air conditioning units. The company was purchased and opened as Air Rescue in 2001; the original company, Sheppard’s, had been in business since 1946, when it was purchased.According to Director of Sales and Marketing Mike Wick, some problems, which can appear as allergies, a runny nose, sneezing and more, can be caused by poor filtration. Technicians for Air Rescue are always on-call, and the call center is available 24 hours per day, seven days a week. “We try to be there within the hour,” Wick said.Air Rescue currently has 112 employees, of which 80 are technicians. Every employee at Air Rescue is drug-free and has had a background check in all 50 states. “Every person you see here can be trusted in your home,” he assured. Technicians also receive more than 200 hours of training per year. When a technician arrives at your home, Wick said they will not park in the driveway, they will park in the street. When they enter your home, they will wear what are known as floor savers or covers over their shoes. “When we are in your home, we want you to be comfortable,” he said.The 18,000-sq.-ft. home office, which includes a training simulator, call office and more, services five counties, including Hillsborough, Pinellas, Polk, Manatee and Hernando. “In that market, there are more than 350,000 homes that have units that are more than seven years old,” Wick said.There are several guarantees and warranties which Air Rescue offers, including a “100 percent money-back” guarantee and a “lowest price” guarantee. For more information or to schedule a service for your air conditioning unit, please call 1-888-NEVER-WAIT or 964-7658. More information about Air Rescue and the services it offers is also available online at www.1888neverwait.com.